High blood sugar is probably the single greatest enemy of having a long, healthy life. Learn the Reasons Why Sugar Is Hard on Your Health and Today’s Greatest Killer? Therefore, each individual must control blood sugar so it doesn’t ruin his or her chances for a long and healthy life! Blood sugar is caused by (although it may not be apparent at first blush) the metabolic mode of the body. Our bodies’ cells can only metabolize sugar or fat in order to gain energy with which to function. Even if a person were to be starving, the cells of the body cannot burn protein for energy, but must first break protein (muscles and bones) down into sugar and then the sugar can be burned for energy. Which signal the hypothalamus sends is the chief determinant of life span and health because of the many issues associated to which fuel is being burned for energy needs. Basically, sugar creates lots of damage as it burns and fat creates less damage because it is more efficient and has less damaging byproducts resulting from it being burned for energy. So, the more sugar a person burns for energy over a lifetime the more damage that occurs to the body, which translates into disease and faster aging. And, conversely, the more fat a person burns, the less damage that occurs and the longer life span and the greater health the person will enjoy. It is very interesting that when a person’s body is in sugar burning mode (hypothalamus is instructing the cells to burn sugar), that person could have hundreds of pounds of available stored fat but the cells of the body will ignore that fat and only burn sugar. In sugar burning mode the cells of the body will think they are starving when blood sugar goes low even if there are hundreds of pounds of available fat. During the night when no food is being eaten (but the body’s need for energy continues), the body will break down bone and muscle in order to get sugar into the blood for the cells to burn. This is the chief cause of loss of bone and muscle mass as people age. Glycation is the (enormous) hidden damage that occurs as the sugar (glucose) in the blood combines with proteins, collagen, and enzymes, and even reacts with cellular DNA. This can trigger serious negative long-term effects that can shave years or even decades off life. The chief way to avoid glycation is to be a fat burner so that blood sugar levels stay low. Elevated blood sugar lowers the amount of HDL (protective cholesterol) in the bloodstream and raises the amount of LDL (harmful cholesterol) and triglycerides. Elevated blood sugar feeds the growth of pathogens in the blood that damage arterial linings called endothelial cells. The two hallmarks of optimum health and longevity are low levels of insulin and leptin. That translates into low blood sugar and low fat stores. When both of these are low, the hypothalamus puts the body in fat burning mode, when they are both high the hypothalamus puts the body in sugar burning mode. So, if you want to live long and healthy, learn to keep your blood sugar low and to not build up fat on your body. Easier said that done, right? Vegetables, seeds and seed oils, sprouts, nuts, wild-fish, wild game are all nutrient dense foods. Of course, E7 (Seven Essentials) is the most nutrient dense food of all. Adding Small Molecule Protein to it makes an ideal start of the day. Bread, pasta, farm raised meat and fish, dessert, white flour and sugary foods and other high glycemic foods are mostly nutrient-empty foods. Stop eating 3 to 4 hours before you go to bed. That means if you go to bed a 10 PM, then don’t eat after 6 or 7 PM. Don’t eat again for 12 to 13 hours after you stopped eating the day before. If you eat your dinner at 6 PM don’t eat your breakfast before 6 am and ideally 7 am. Exercise (if possible) either before eating your first meal of the day or after your last meal of the day. If you can’t exercise, then add one hour to the above times — meaning stop eating 4 to 5 hours before going to bed and don’t eat until 13 to 14 hours after eating your last meal of the day. Also take HGH boosting supplements such as Arginine just before going to bed. Minimize stress and sleep sufficiently each night. Adrenaline and cortisol force the body into sugar burning mode (sugar burns faster and so stress always pushes the body into sugar burning mode so that energy will be instantly available to fight or run). 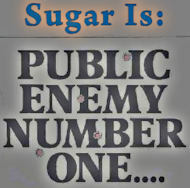 The problem is that our stressful modern life can keep us in sugar burning mode in spite of no “mortal enemies”. Sleeping earthed is the best way to de-stress each day. Also, arginine supplementation will help promote sound sleep. The longer that blood sugar remains out of control, the shorter your life. Insurance statistics compiled by Equitable Life Insurance indicate that 29-year-old diabetics lived 16 years less than non-diabetics, 39-year-olds lived 11 years less, and 49-year-olds lived 10 years less (Goodkin, 1975). Even if you aren't diagnosed as a diabetic, poor blood sugar control can have just as devastating an effect on your health and lifespan. In fact, people who are undiagnosed or borderline diabetics may have almost the same mortality as regular diabetics. How exactly does persistent high blood sugar damage the body? Excess glucose spurs an elevated production of "glycated proteins," which are proteins that have been damaged by binding with sugar. Such glycated proteins react with oxygen to form superoxide free radicals that can degrade collagen, the structural matrix of our body. They also trigger an escalating accumulation of "advanced glycation endproducts"--one of the hallmarks of aging. Even worse, glycated proteins can also transform themselves into hydrogen peroxide and hydroxyl radicals, which are far more potent free radicals than superoxides and far more destructive to the proteins of our tissues, organs, immune system, and muscles (Gillery et al., 1996). Studies have shown that elevated blood sugar levels are a major cause of kidney failure, cardiovascular disease, and arteriosclerosis. Perhaps this is one reason why diabetics have twice the mortality risk as non-diabetics (Lancet, 1999; Shaw et al., 1999). Moreover, diabetics with poorly controlled blood sugar have over four times the risk of dying. Studies by Rabinowitz, Ziebler, and other researchers showed that high blood glucose levels are directly linked with a stunted production of growth hormone (Rabinowitz et al., 1963). A deficiency of growth hormone can accelerate the aging process. How do you maintain low blood sugar levels while having sufficient energy to function? Answer: By eating a nutrient-dense food diet that will keep your body in fat burning mode. In a large study of insurance mortality statistics, researchers found that the mortality rate was lowest in diabetics treated by diet alone, rather than diet and hypoglycemic drugs or diet and insulin. Some of the best foods include rolled oats, cracked barley, buckwheat, millet, and brown rice. Other great foods are protein foods such as avocadoes, small fish and eggs. There are also several sweet-tasting dietary supplements that are virtually calorie-free have a glycemic index of 0, and are packed with other health benefits: Stevia, FOS and Xylitol. These supplements are not just ideal for diabetics but for anyone interested in managing erratic blood sugar levels, such as those with reactive hypoglycemia. In fact, eating the right foods can have a bigger impact on blood sugar control and lifespan than either insulin or hypoglycemic drugs.